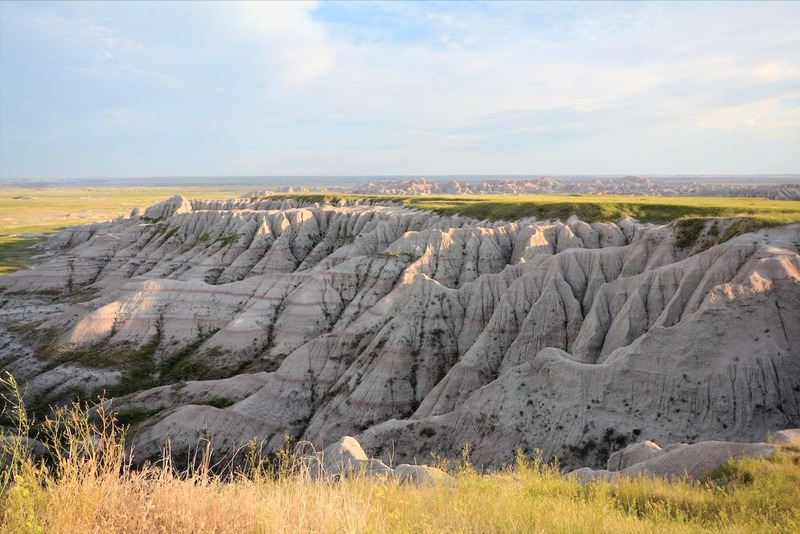 The Badlands of South Dakota, and Badlands National Park, are truly unique in the western Great Plains. Its easy to understand why they were named as such. The landscape is beyond comprehension. The views here are engrossing. 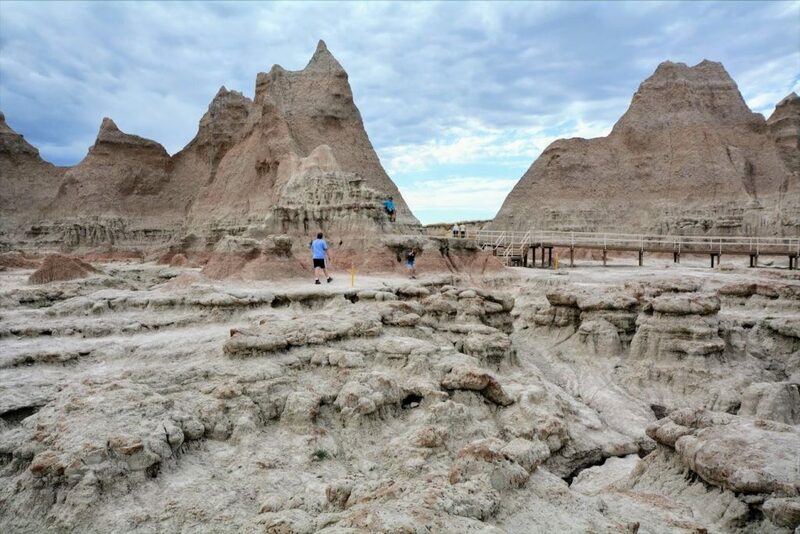 This was our first trip, ever, to South Dakota. And we’re so glad we made time to come. The landscape boggles the mind. And there is plenty of it to explore. We spent a couple of nights here, but could easily have spent twice that amount. Trails are well-marked, so be sure to stay on them. It would not be good to get lost out here. 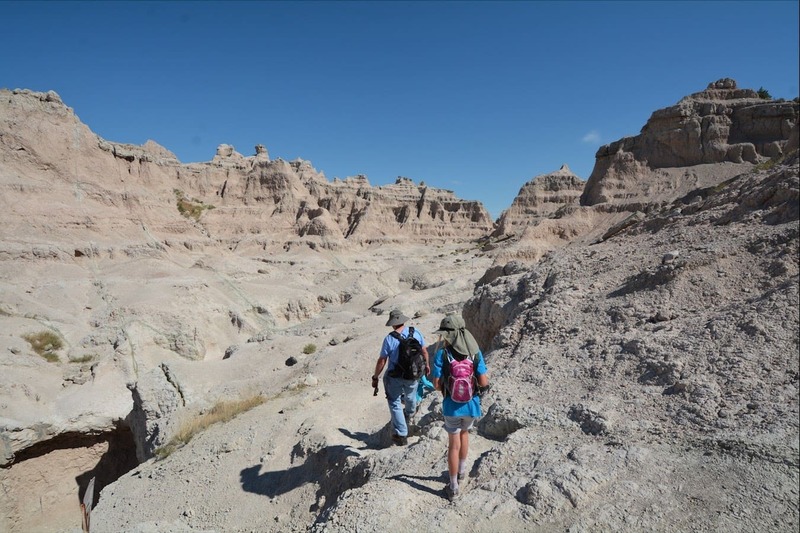 Opportunities for hiking abound in the Badlands. 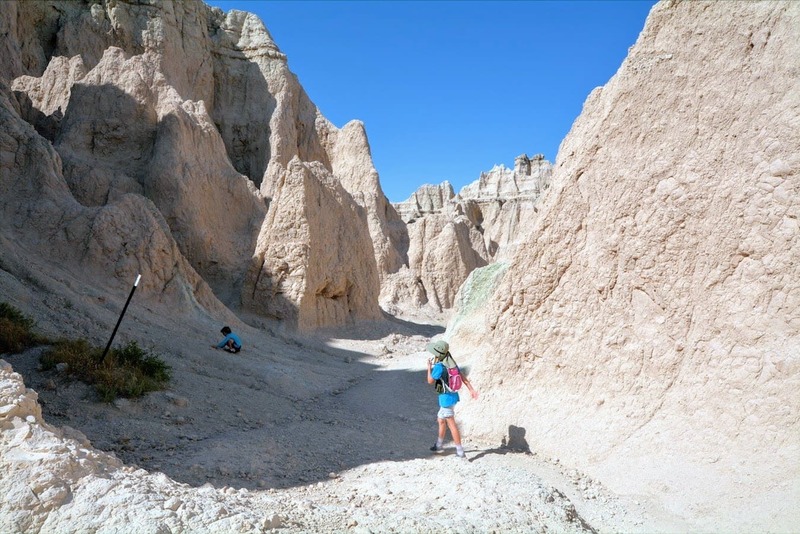 There are trails for every experience-level, and for every time constraint. We spent the better part of an afternoon exploring the Notch Trail, which begins at the south end of the “Door and Window” parking area. 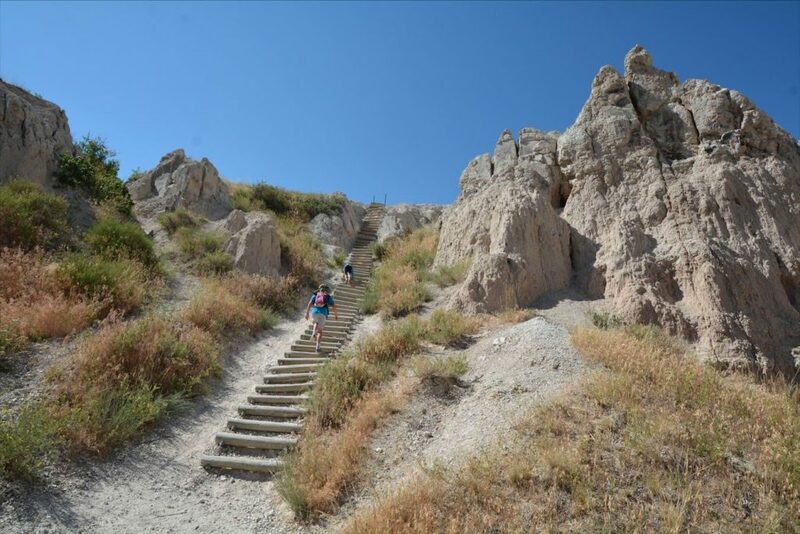 The Notch Trail is classified as moderate-to-strenuous. Notice the huge wooden ladder in the picture below? The round trip (out and back) was only 1.5 miles, but afforded several different views and experiences. 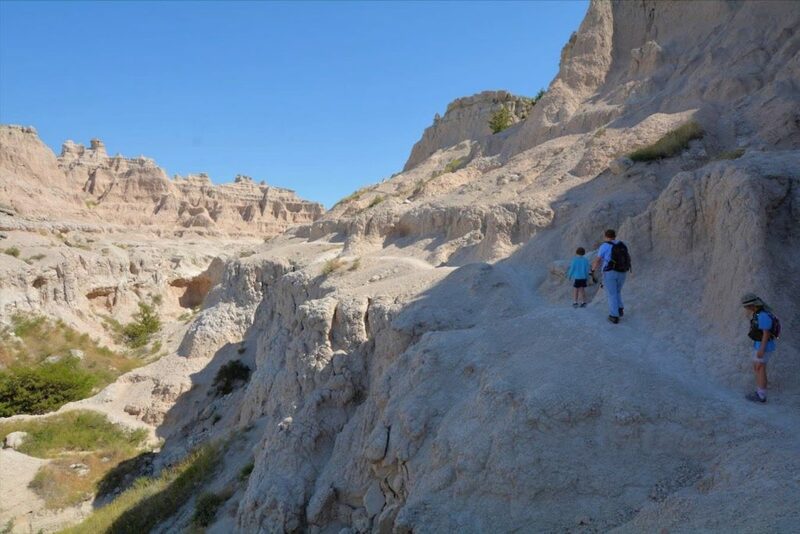 Much of the Notch Trail traverses along the side of some pretty tall cliffs. Watch your step! Signage is present where the trail gets sketchy. Nothing you (or your kids) can’t pass. But stay focused so no one slips up. The trail can be particularly dangerous (and not recommended) after or during heavy rains. The day we were here was incredibly hot. About 100 degrees Fahrenheit! In such conditions, its absolutely crucial to carry enough water. We did. And even so, our son still became heat-stressed by the end of this fairly short trek. 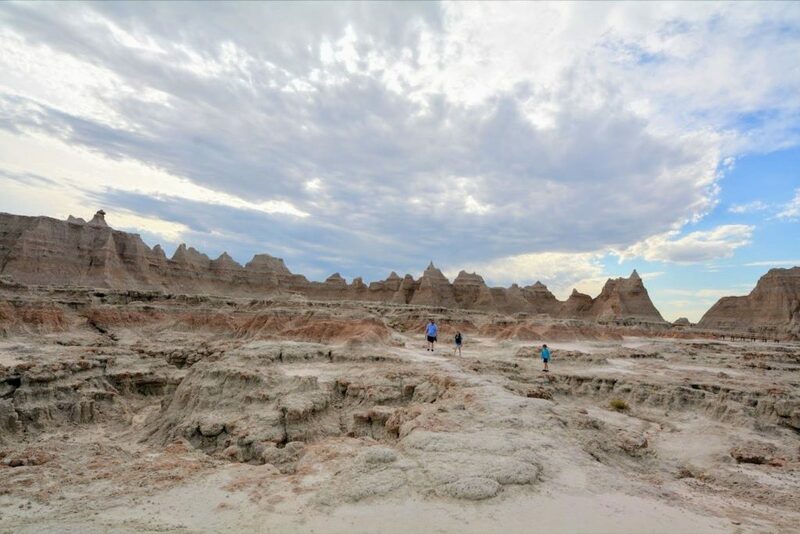 The trail ends with a dramatic view (payoff!) of the White River Valley. 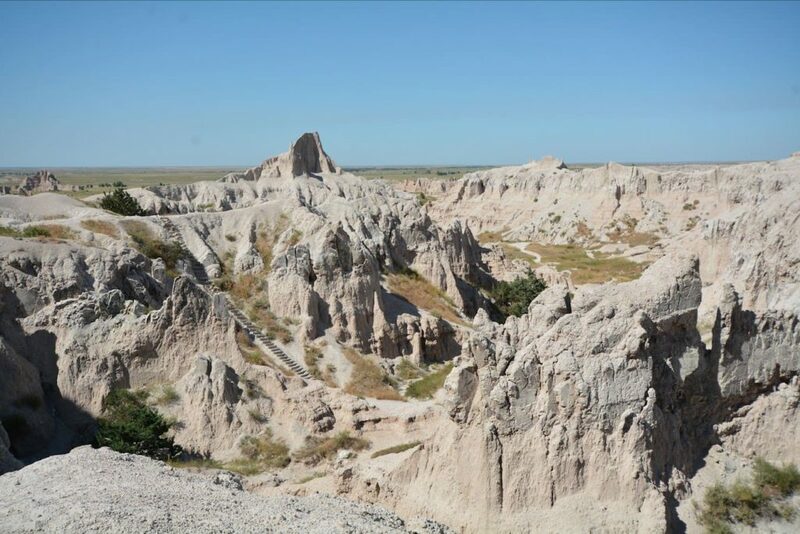 Even if amazing geology isn’t your thing (robot voice: ‘does-not-compute’), there’s another very compelling reason to visit the Badlands. Opportunities abound to see wildlife of all sorts, including rare and endangered species. 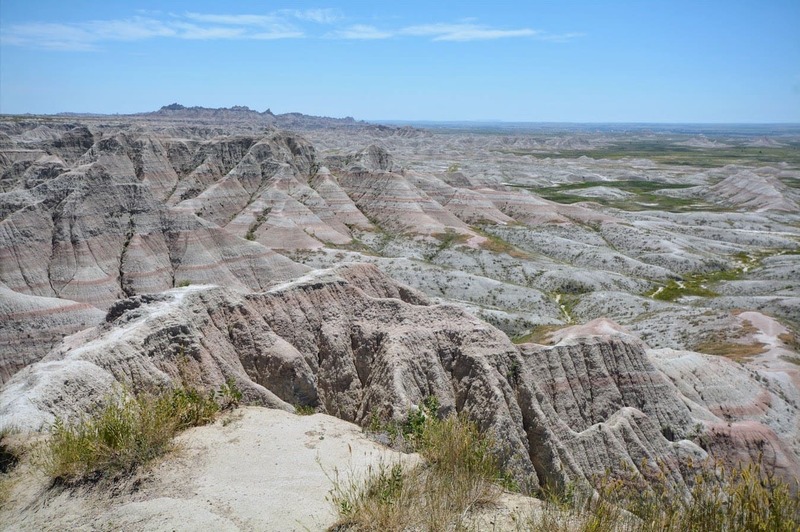 Many animals make this inhospitable terrain their home, including bison, antelope, mule deer, black-tailed prairie dogs, and coyotes. 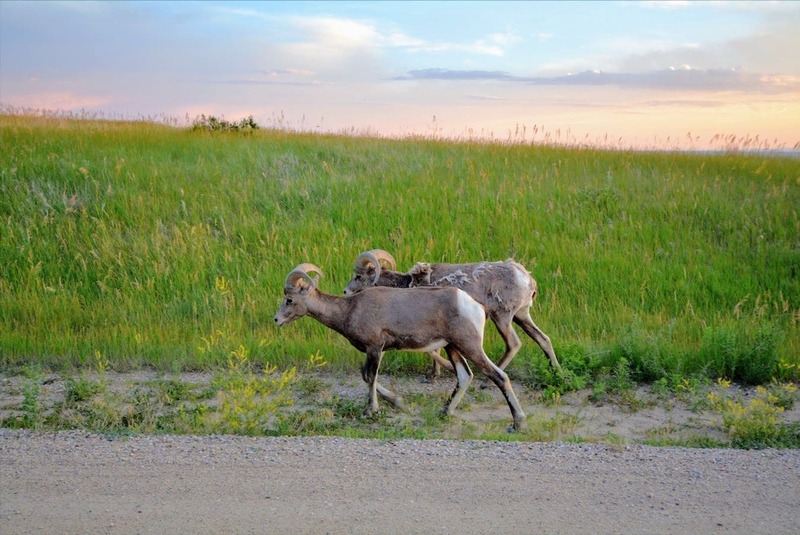 Easily one of the biggest wildlife draws, is the presence of well over a hundred bighorn sheep who live throughout the park. 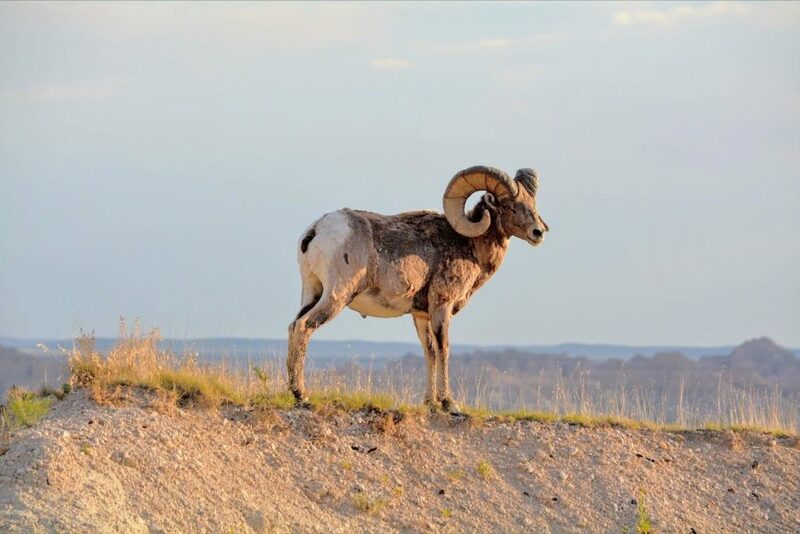 Bighorn were actually hunted to extinction in the Badlands in the previous century. In 1960, they were reintroduced to the area. And happily, the population has flourished. We saw all of the sheep pictured here from the safety of our car as we drove along Rim Road (which becomes Sage Creek Road), on the way to our campsite. 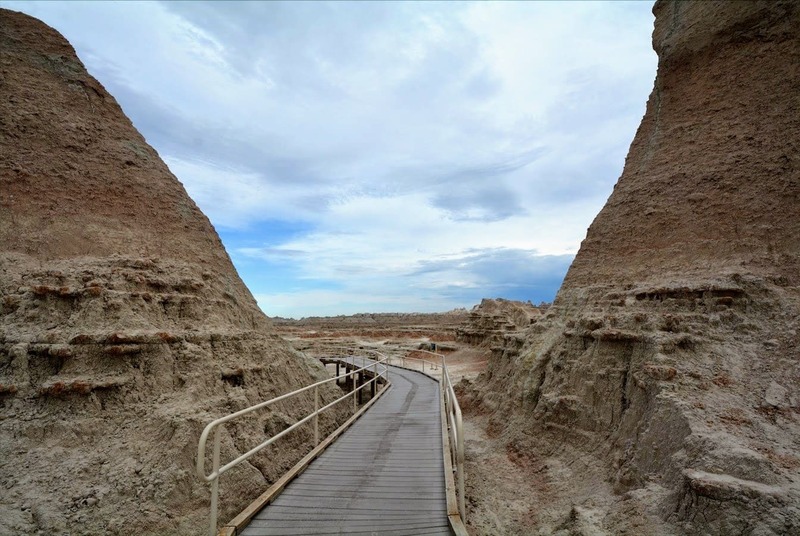 We stayed in Sage Creek Campground, which provides a couple dozen open-style campsites. I.e., there aren’t any marked “sites.” Just a couple of large fields where you can set up. Sage Creek is first-come, first-served. And the open-style means that, in the busy season, you have plenty of opportunity to meet your neighbor! 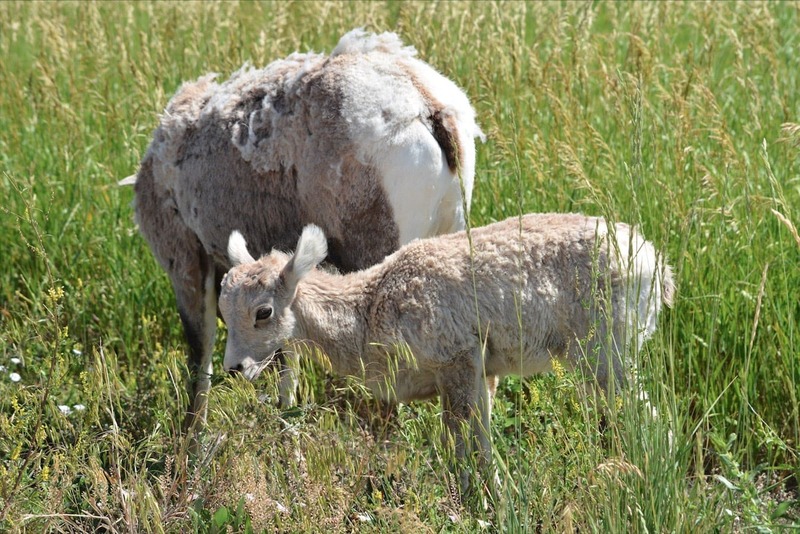 There was a large male bighorn sheep (females, like the ones above, have horns, too) just off the side of the road. We were able to shoot the pic below using Janka’s zoom lens. 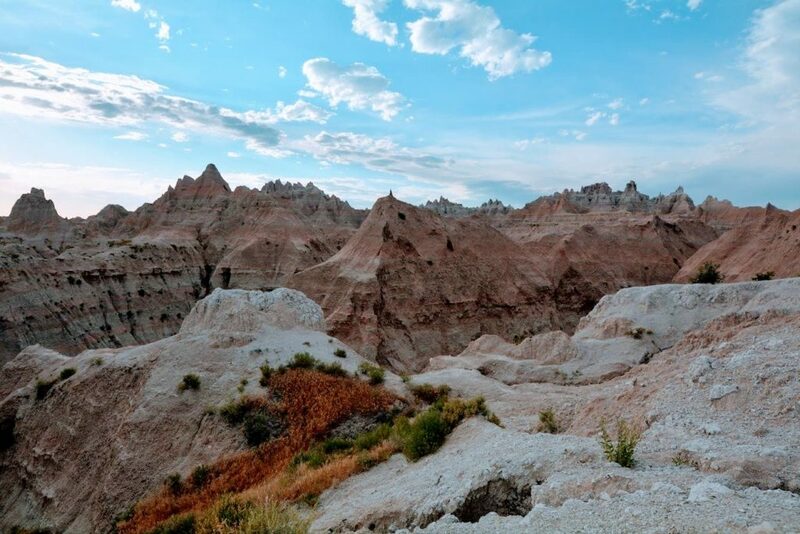 One of the most disconcerting phenomena we ran across during our trek through 40+ national parks was, the over-preponderance of knuckleheaded tourists who insist on approaching wildlife. We saw it in almost every park we visited! As we sat taking the picture above, from a safe distance and from inside our vehicle, a guy pulled over in front of us and began hustling toward the large male bighorn. As he passed my window, I felt it necessary to remind him that the park requires, by law, and for reasons of safety, he not approach wildlife. The safety, that is, of both beast and man. 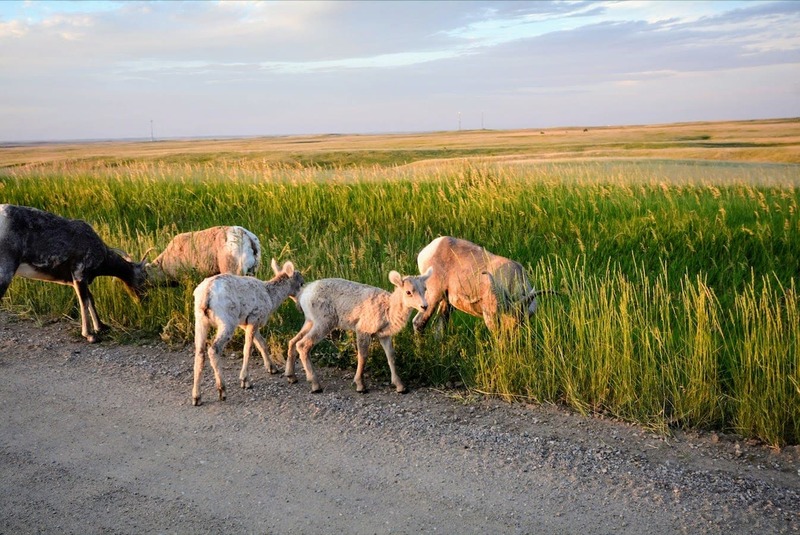 Approaching wildlife is illegal for a reason….It’s dangerous! I don’t think that’s how it works, buddy. Also, get a load of the telephoto lens this guy is packing. 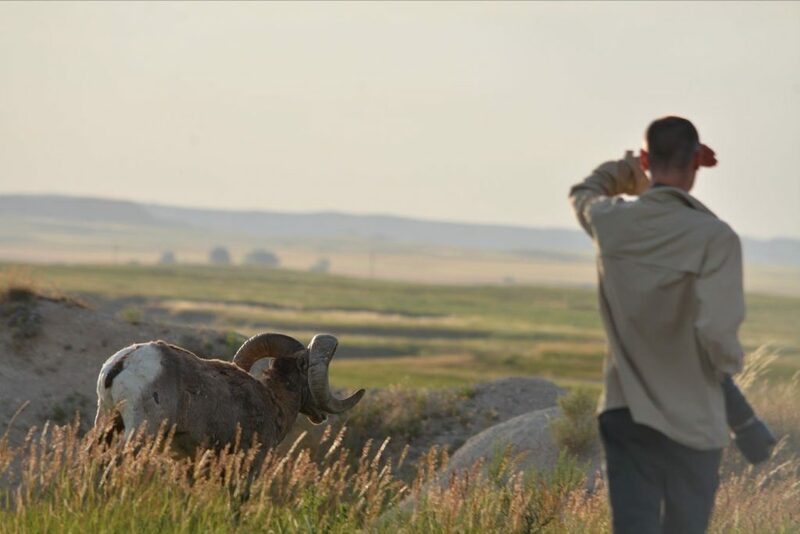 Does he really have to get within 10 yards (notice in the shot above, he’s still stepping forward) of a completely wild, and federally-protected animal, to get his shot? I question this guy’s “professionalism,” as well as his judgement. Buying an expensive camera doesn’t make you a professional. But approaching wildlife in a national park puts you on the wrong side of the law. And of common sense. We’ve said it before, and we’ll say it again. 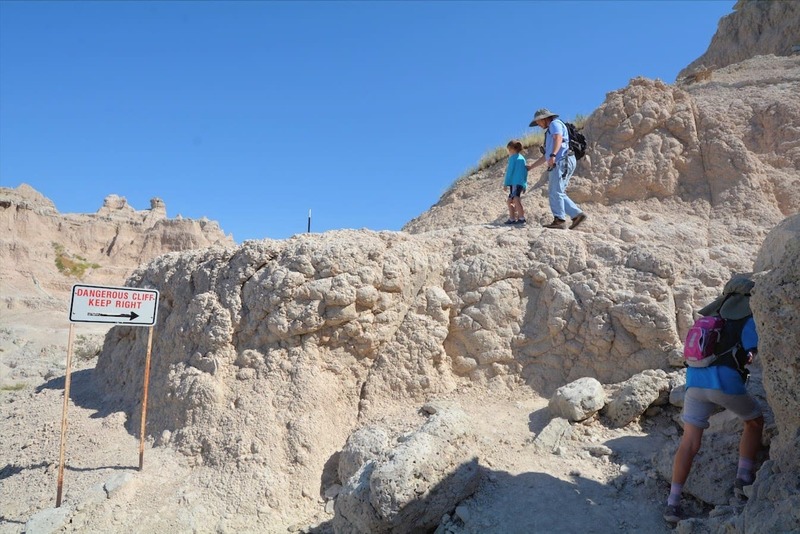 Please follow the rules when you’re in National Parks. They’re there for a reason! Our second (and final) night in Badlands, we returned to our campsite to find our tent completely destroyed by the wind! We couldn’t believe it! Luckily, we had a couple of spare 2-man tents that we used to get through the night. Also luckily, we bought the tent at Costco. We love shopping at Costco for a lot of reasons, not the smallest of which is their liberal return policy. They were happy to refund our purchase price for the destroyed tent. But camper beware! 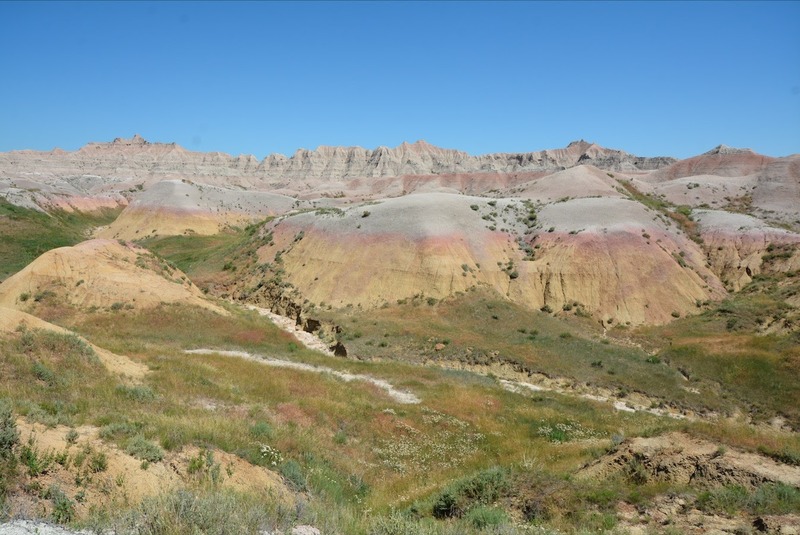 The Badlands live up to their name for several reasons. If you’re planning to camp longer than one night, maybe consider having a spare tent. Or, if you only have one tent, check the weather forecast. 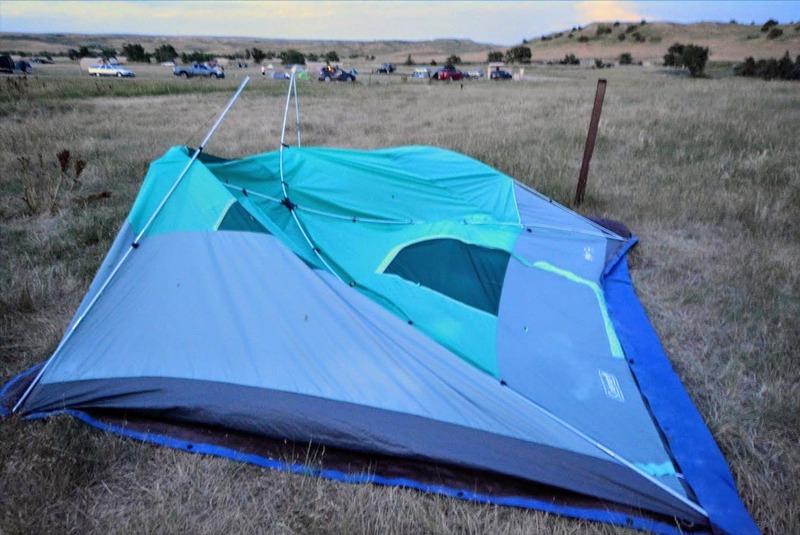 If high winds are predicted, you might want to take down your tent during the day so you don’t return to a similar situation! We’d love for you to be a part of our virtual family. We send out a couple of communications each month just keeping you updated, sharing thoughts, checking in. If you’re up for it, enter your email below. It’ll be fun!